In 2003, Ellen Potter made a lively splash onto the scene with her middle-grade novel Olivia Kidney. She went on to write three sequels about that enchantingly quirky heroine, as well as two other novels, Slob and The Kneebone Boy. 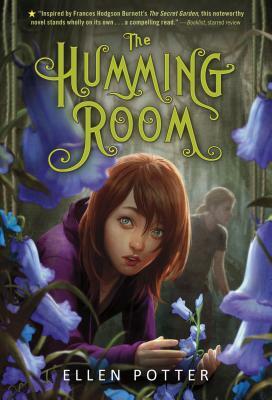 Most recently, the author tapped into memories of her own childhood reading to pen The Humming Room, a novel inspired by Frances Hodgson Burnett's The Secret Garden. Set in a mansion-a former children's tuberculosis sanitarium-on an island in the St. Lawrence River, the story centers on Roo, a prickly orphan who goes to live with her aloof uncle, and befriends Phillip, his troubled son, and Jack, a local boy. Potter talks about how this novel took shape. Is it safe to assume that The Secret Garden was an important book to you as a child? Obviously, I loved the novel as a kid. What really struck me was that when I went back to read it as an adult, the story not only held up, but I discovered elements in it I had never noticed before. It felt very fresh, and surprisingly layered in a way I hadn't realized as a child. Was that an unusual reaction for you to have to a book you revisit from your childhood? Yes, very unusual for me. A lot of times when I go back to books I loved when I was young I don't quite understand what it was that I loved about them. Rereading The Secret Garden, I felt a lot like Mary feels when she visits her garden. She's always finding something new popping up-something delightful or surprising. I've reread The Secret Garden every year as an adult. I have a battered copy on my bookshelf-it's really quite a mess! The experience of reading the novel keeps deepening for me. How did you tackle the actual writing of The Humming Room? The idea of writing a contemporary version of The Secret Garden was very exciting to me, yet at the same time it was very, very intimidating. I knew I needed to follow the original story line-or that I wanted to-but I knew I had to make it different enough that it would be worthwhile for people to read my novel. My editor, Jean Feiwel, was great and kept encouraging me to have at it, to go anywhere that I felt I had to go with it. Did you set parameters for yourself, in terms of working within Burnett's original storyline? I actually kept trying to swerve away from the original story, but it wasn't easy. There's something about The Secret Garden that kept me rooted in the original storyline, which was difficult for me. I don't plot my novels-I move along with my characters. For the first time I had a story already set out for me, which was very challenging. Would you say that you heard Burnett's voice in your head as you wrote? Yes. I feel I know The Secret Garden so well that I could kind of riff on it like a jazz musician. I know it in my core, and could take the essence and work with that. Still, I love the original novel so much that it was psychologically a very tough book to write. Though I think whenever I finish a book I always say it's the hardest thing I've ever written! You obviously did branch out from the original, with the setting to begin with. Why choose an island on the St. Lawrence? I went back and forth on the setting, actually. At first I thought of perhaps setting it in New York City, but that didn't work. At the time I began writing the novel I was living in the Thousand Islands, and was spending a lot of time on the St. Lawrence. The river is so very beautiful, and it struck me as similar in some ways to the moor in The Secret Garden. The St. Lawrence seems a vast expanse of gray, the way the moor is a vast expanse of purple. But if you stop and look closely at the river, it's incredibly changeable and moody-and sometimes violent. But it's always surprising. And it occurred to me that this would be a perfect setting for The Humming Room. On top of that, there are quite a few mansions in the Thousand Islands with ghost stories attached to them. It's quite incredible. So that inspired your mansion setting, with mysterious humming noises and an abandoned garden hidden within it? Yes, and I decided to make the mansion a defunct sanitarium, because I wanted there to be a ghostly presence, an eerie echo, in the house. One of the things I loved in The Secret Garden, and tried to put in my novel, was that there was a consciousness to everything-the house, the moor, and the garden. They are really characters themselves. In my novel, I wanted to give this same consciousness and self-awareness to the mansion, the river, and the garden, to give them personalities. How did you set out to make Roo, Jack, and Phillip distinct from-and have a more modern sensibility than-Burnett's characters? One thing I remember about Mary and Dickon is that there was a little squeak of romance in their relationship, but it was so understated. As a child, I remember wanting more romance in the book. So I brought out a bit more romance between Roo and Jack. It's a young romance and entirely innocent, but it's there. With Phillip, my Colin character, I tried at first to make his ailment physical, like Colin's, but that didn't work, so I decided to give Phillip a more mental affliction, which worked better for the story. And like Mary, Roo starts off as a not very likable character-she's a pretty tough customer. That's unusual for a heroine, and I loved that about The Secret Garden. But before long Mary begins to blossom, and that happens to Roo as well. Have you tackled another writing project since finishing The Humming Room? Yes. I'm working on a series for younger readers, for Feiwel and Friends. It's directed at boys-though I think girls will like it, too. I have a son who is seven, and I've been noticing for a while how few very engaging books there are for boys around that age. They somehow get the short shrift. Boys at that age who are big readers are reading books like Diary of a Wimpy Kid, which deal with middle-school issues that seven-year-olds are not yet concerned about. So I'm trying to write something along those lines, but more appropriate for younger kids. As I write, I've been trying out scenes on my son. I wait for his giggle, and if it comes, I keep that part in the book. Luckily, it's a method that seems to be working quite well!